Developmental Vision Associates, PC, is Omaha's premiere developmental vision team with over 20 years of experience in diagnosis and treatment. 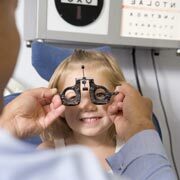 We are dedicated to providing the highest quality vision therapy to children and adults in a friendly, comfortable and professional atmosphere. With a highly trained staff of vision therapists and state of the art equipment, you can be sure you will receive the best vision care available. Treatment for Learning-related Vision Problems including ADD/ADHD, Dyslexia, Tracking Problems, Reading disorders like poor comprehension. "In human society, most information is acquired through the visual system. Uncorrected impairment of visual functioning can prevent the normal acquisition of information and lead to difficulties in learning...There may be subtle abnormalities of binocular functioning, accommodation to close visual targets, or higher processing of visual information that interfere with the learning process. Detection of any such abnormalities...at the earliest possible point in a child's development is crucial to the prevention of subsequent learning disabilities that might otherwise ensue." There's more to vision than good health and 20/20 eyesight!